Adoption Agency CA: Can I Love My Adopted Child As Much As My Biological Children? Many people across today’s society take a favorable position on adoption. The private adoption process can help to put more children in need into the arms of more loving families. If you have considered adopting a baby, we applaud your courage. The process of open adoption relies on bravery from both the birth mother to make a big sacrifice for the good of her baby and the new parents to take on a lifetime of parentage and learning. People from all walks of life elect to take part in this process that seeks to provide the very best for the child. Regardless of your motivations for adopting a child, one question may arise that will likely be difficult to face — will you love my adopted child as much as you love your biological offspring? As a successful alternative to any adoption agency in California, our center works to provide the best possible outcomes for everyone involved. A is 4 Adoption is proud to help you through every step of the process, delivering quality birth mother help and timely results for waiting families. We understand the concerns voiced by both parties, and work to provide the best outcome. Today, we’ll discuss a few points that may help you connect with your adopted baby. And don’t worry, you’ll do great! Can I Experience an Immediate Bond? Many people we help at our adoption center are told that childbirth results in an instantaneous bond between mother and child, built on months of prenatal development and growth for both individuals. This fast attachment sounds ideal, and the truth is often far different. New parents often face difficulties in bonding with their newborn, feeling more like guilty roommates than doting caregivers. In many cases, an intense bond does not come guaranteed for biological children. As an adoptive parent, it is important for you to know that the deep bonds that benefit parents and their children normally develop over time. Shared experiences will do much to cement the closeness within families that are adoptive, biological, or both. Keep in mind that every situation is different. You may not love your firstborn immediately, but bond quickly with your adopted child. New parents will find that these experiences and dynamics play a large role in bonding, not genetic relations. Can I Provide the Same Love? One concern our adoption center hears of frequently concerns the fairness in what type of love is given to each child. 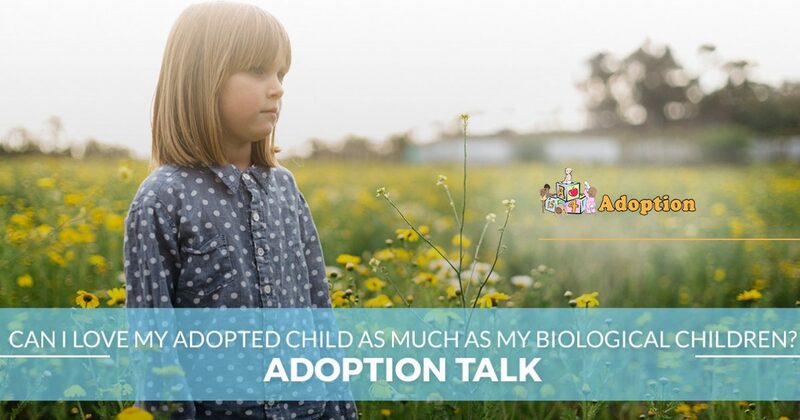 You know that you will love your biological children, but will it vary from an adoption baby? We like to think of the phrase “biological” as a tag when it comes quality parenting. In reality, your role as the parent will be unchanged by whether or not the child has your genes. This miracle child will rely on you for guidance, support, and care every step of the way, regarding you as the parent in every sense of the word. When people ask about your kids, words like “adopted” will be left behind in favor of more inclusive words. This is not an adopted baby — this is your child. What If I Don’t Feel The Same Love? Many parents fear that they will be unable to provide love to their family in a balanced and fair manner. As we have said before, the speed at which you bond with your biological or adopted child can vary, and you may be unsure as to how close you are at first. We understand this concern, and want to remind you that closeness often comes from shared experiences. Older children can spend more one-on-one time with the parents, providing the bonding time needed for each kid to feel included and special. Now would be the perfect opportunity to reinforce that they were adopted because you loved them before you even met them. Involving the family is also a beneficial way to create a lasting bond between biological and adopted members alike. Be sure to go on family trips to build new experiences for your expanded family. Parents of an adopted infant can still use this opportunity to bring baby into the adventure, allowing the other children to experience bonding time as well. Parents who struggle through this process can benefit from a wealth of resources, including support services. No matter how your child begins their life within the family, it is essential to remember that your love will overcome any worries or doubts you may have. Keep in mind that love was the reason you decided to learn how to adopt a child in the first place. A is 4 Adoption is here to help families nationwide to find a fast, beneficial outcome that often far superior to any adoption agency across California. We understand the complexities of the adoption process, and will work hard to match you with a baby in need. Contact us today to learn more!